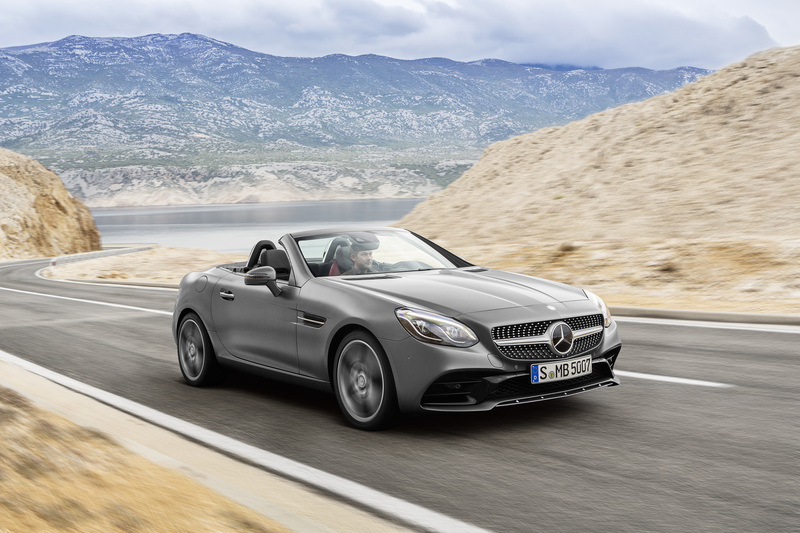 This is the impressive new Mercedes SLC and takes the firm’s popular compact roadster to a new level. Replacing the SLK, the SLC utilises a new look and technology and acquires the ‘C’ to underline its close relationship to the C-Class. That’s because most of the technology has been derived from the C-Class which helps to make the new Mercedes SLC an excellent vehicle. From the entry-level Mercedes SLC 180 to the flagship Mercedes-AMG SLC 43, the new car will be a big success. The new car has a tough act to follow; in the 20 years the SLK has been available it’s managed to set new trends and establish itself as a winning roadster. Mercedes have sold more than 670,000 versions of its roadster and hopes are high that the new model will be just as popular. The firm has introduced a new front section in a bid to hold the car’s sporty look and the bonnet is more arrow-shaped. There are five models available from launch and the Mercedes SLC 180 has a 1.6 litre engine that will sprint from 0 to 62 mph in 7.9 seconds. Its top speed is 133mph. At the other end, the Mercedes-AMG SLC 43 has a 3.0 litre engine with a sprint time of 4.7 seconds and a top speed of 150mph. The new car has been engineered to deliver an incredible driving experience and drivers can use the Dynamic Select function to alter the car’s settings to deliver more driving enjoyment. Depending on the setting, it’s also possible to change the set-up so the sports exhaust can be ‘acoustically altered’ to give a true roadster roar when accelerating. Available to order from the middle of January and deliveries are expected in April. There’s no news of prices yet but they will be similar to the current SLK.